“Nice to meet you all,” wrote Hyung-Jin Shin, using only his eyes. From his adjustable bed, Shin made the words appear on the computer screen using Eyecan+, an eye-tracking device developed by Samsung Electronics. Shin, a graduate student in computer science at the Yonsei University in Seoul, has worked with Samsung on developing the Eyecan user experience. He was born with quadriplegia, or paralyzed limbs. Samsung designed the Eyecan+ to help paralyzed people like Shin interact with computers, using eye movements and blinking to perform common operations such as typing, copying and pasting, clicking, scrolling, or zooming in and out. 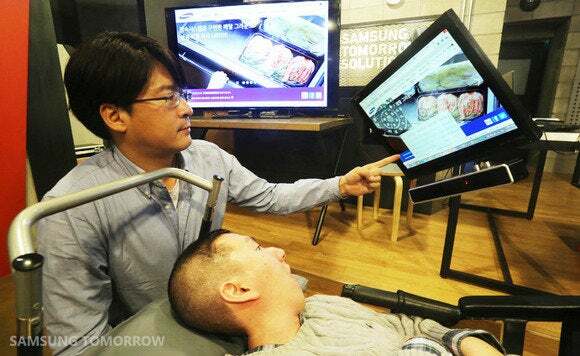 Although the eye-tracking technology may have other applications, Samsung sees it as particularly helpful for those paralyzed as a result of a spinal cord injury. Other potential users include those with progressive neurodegenerative disease amyotrophic lateral sclerosis (ALS), commonly known as Lou Gehrig’s disease. It is illness in which patients lose control of mobility and in the later stages are only able to use their eyes. The portable, wireless device sits below the computer monitor and can respond to the eye movements of a user 60 to 70 centimeters away. After a one-time calibration process, the Eyecan+ shows a pop-up menu on the screen, which provides 18 commands that the user can choose from. Eyecan+ is the result of a voluntary project by Samsung engineers, the company said. The South Korean electronics maker introduced the first Eyecan in March 2012, and since then calibration sensitivity and the user experience have improved, it said. Samsung has no plans to commercialize the Eyecan+ and will make only a few of the devices to donate to charity organizations. However, it will make its technology and design open source, it said. Recent advances in eye tracking technology are expected to allow a proliferation of new applications. Tobii Technology in Sweden, for example, offers a Windows 8 Pro tablet which users can control with their eyes to perform tap, swipe and scroll gestures. The Tobii controller comes in a form of eye glasses, too.